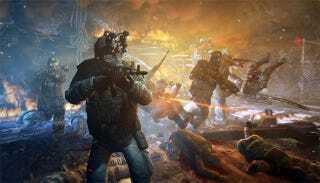 GameStop pulled Metro: Last Light from its Impulse digital download service, telling GameSpot that the uncertain fate of its publisher, THQ, is the reason. "Due to THQ's current financial situation and uncertainty of delivery, in order to protect our consumers we removed the ability to pre-purchase that specific game," GameStop's top spokesman told GameSpot. THQ is currently in Chapter 11 bankruptcy protection and selling off its assets, including projects in development and the studios making them. Bids are due Tuesday; the auction will be conducted on Wednesday. Originally, THQ had structured a sell-off through which a private equity investor was likely to grab everything for $60 million and life at THQ would continue more or less uninterrupted, under new ownership. THQ's creditors objected, and while Clearlake, the investor company, may yet get all of THQ, bids will be taken on individual holdings as well. Parties as diverse as Warner Bros. Interactive Entertainment and Double Fine Studios, which made a couple of games THQ published, are said to be interested. The fact Metro: Last Light could end up in someone else's hands may be behind the delisting here. Still, preorders for retail boxed versions of Metro: Last Light on PC, Xbox 360 and PlayStation 3 remain active through the main website. GameSpot reports that anyone who already prepurchased the PC download of Metro: Last Light can get a refund through GameStop customer service.